In 2016, contract negotiations broke down between the administration and AFT 2026 (the college union). It was partially over salary and benefits, but more fundamentally it was about CCP’s future. The union and administration have very different visions for our city’s only public two-year college. The emphasis is on employer needs. It is true that employers provide jobs that Philadelphians need. Untrue, however, is the idea that employers have an interest in overcoming the many obstacles to graduation facing so many CCP students. It is easier for the administration to focus resources on high school programs for the “gifted”, students who don’t need assistance, or corporate training programs, which often overlook those most in need. Students’ needs are expensive. More help means more faculty attention, and ultimately more money spent. The business-first vision seeks the most “efficient” path to meeting business needs. If thousands of students, faculty, and staff are pushed aside to accomplish this agenda, then so be it. That’s just good business. The union sees CCP not as a business, but as an institution for building working-class communities and providing working-class people with opportunities for a better life. The working class and poor have been excluded from the recent economic recovery. Education is part of the solution to this neglect. This student-first approach is an affirmation of every person’s worth. It is a promise, that the faculty and staff will dedicate themselves to ensuring the success of all. No student should be abandoned because it is deemed too expensive to address their needs. The administration’s contract proposal would require new faculty to teach five classes per semester, instead of four. President Generals says this is “industry standard” since most area community colleges already teach five courses. Union Co-President Junior Brainard, argues that this is not a fair comparison for two reasons. CCP faculty members teach more students per semester than most area colleges. The union argues that teaching a fifth class would add 20 more students per semester for each member of the science faculty, 30 for English, 40 for math, and 56 for computer-science. This increased faculty burden is paid for by the students in need who need more, not less, faculty facetime. CCP students pay the highest tuition of area community colleges. Yet once again they’re being asked to shoulder more costs so that the administration can save a few dollars and pursue an agenda that does not serve them. Hazim Hardeman, CCP’s first Rhodes Scholar, said it best. “The students whose parents can afford it get comparatively well-supported faculty and staff at Temple, Drexel, and Penn. The kids who can’t, get overworked faculty and staff at community colleges.” He asks the union to “please fight this reality.” A supported staff and faculty is a supported student body. The second reason highlights the administration’s blatant neglect. CCP students primarily come from neighborhoods with high poverty and low educational attainment. More than 50% are over 25, many are single parents, and most are working students. They are immigrants, first-generation students, and 70% remedial learners. These students have high needs which are routinely ignored. Staff earn as little as $12/hour. The administration says no benefit changes will occur for workers making under $40,000, but considering their willingness to trade student needs for business needs, it is hard to trust this promise when it comes to the basic needs of staff members. As the union declines under this new contract, benefits will almost certainly fade. Strong unions are the only defense against being robbed of retirement and healthcare, or being fired without cause. That is why it is critical for them to eliminate the union. The power of organized workers is the main pillar of defense for our city’s public institutions. The union knows what is at stake and that is why on March 28th, they voted to strike. The strike vote is an acknowledgement of the stark choices facing workers and students. The stakes are high. If the administration successfully forces the union to accept the conditions outlined above, it will be devastating. Students and workers of greatest need will pay the highest costs. Workers refuse to allow this power grab. The union is asking the administration to implement simple reforms which will unburden workers and allow them to effectively serve our students. The staff and faculty cannot offer support unless they themselves are supported. That is why they are saying that one job should be enough. When staff cannot support themselves and have to work multiple jobs. It hurts students. When faculty have ever growing classrooms and long stressful workweeks. It hurts students. When CCP is short-staffed. It hurts students. The strike is about saying, enough. Our students are not for sale. 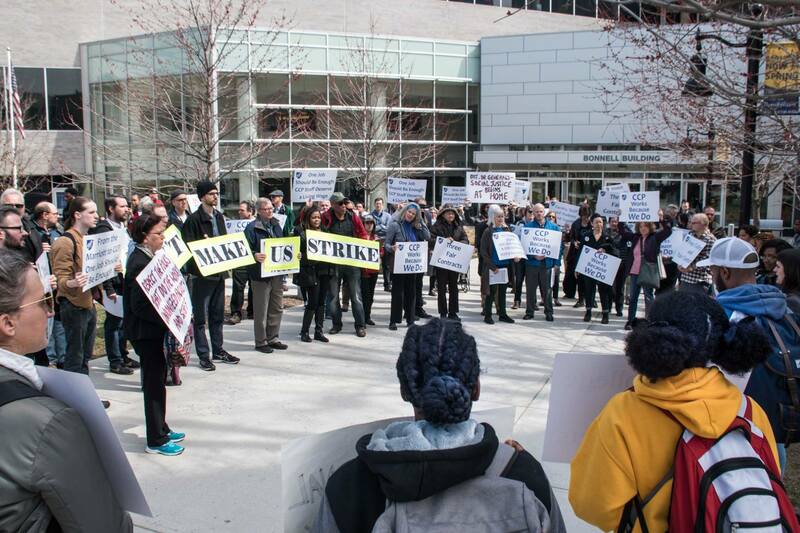 Until the administration returns to CCP’s promise of “making higher education affordable and accessible to all Philadelphia residents,” the union is on strike.